I mentioned before about my friend from school, H, who’s wife died a little while ago. Unfortunately, I could only go to the funeral for the day but I made the effort and went over on our long holiday weekend – the one just gone, to spend some time with him. I tried to let him do most of the talking. I thought it was the least I could do. We are blokes, after all, and we don’t do the opening up thing very easily – at least, face-to-face. But I think he did a bit and I really hope it helped him. But his story is not my story to write. I found the UK to be nicer than I had thought it would be. Admittedly, although not so far from London, this was the middle of the countryside and reminded me a lot of Herefordshire. The first night we went out, with his daughter and son, to The Fox Inn in Rudgewick. It was a typical old English pub serving food. The food was wonderful (Steak and Ale Pie with mashed potato) and, of course, there was the beer. A very nice start to the trip. The next day we we to his daughter’s new house. It was a lovely old house which she had started doing up. We went for lunch at The Crown Inn in Chiddingfold. Again, a typical English village pub with an open fire. Of course, I don’t eat so much and, in the end we had (H & I) some sharing nibbles. And some beer! God, I miss the English beer. Food was good and the place was very nice. In the afternoon we did some shopping (for me) in Cranleigh, apparently the biggest village in England (or, maybe the UK?). It was very pretty. We were back there in the evening to go to The Curry Inn – not an inn at all but rather a good quality Indian restaurant. H had asked me if it was OK to go out with some of his friends and gave me a choice of Thai or Indian – which. of course, meant Indian. And boy, the curry I had was the best curry I’ve ever had. It was incredibly busy which, of course, means it must be good but the downside to that was we did have to wait an incredibly long time for the food. But, for me, the wait was worth it! Of course, it was Indian beer but you can’t have everything! The next day it was raining all bloody day. However, H took me on a trip around and to his “baby”, some all-weather football ground (he’s very sporty) that he’d managed to get built. 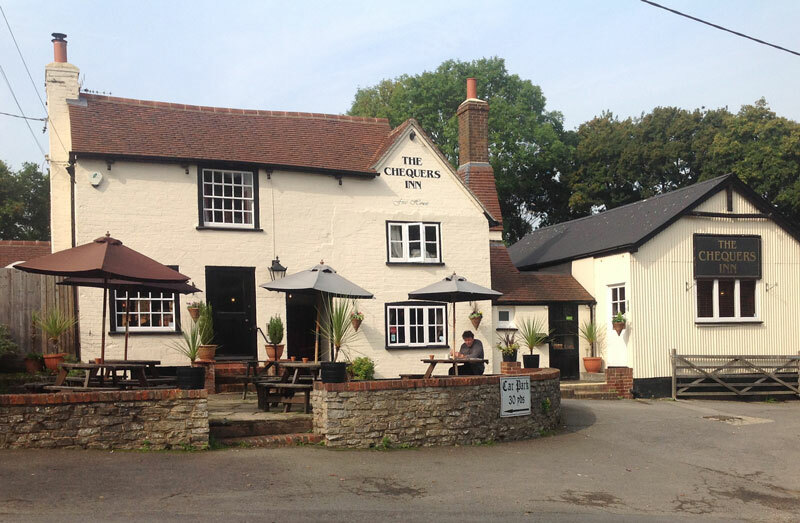 Then a bit more shopping and then, at my request, we went for a proper Sunday Lunch at The Chequers Inn in a tiny village called Rowhook. Again, a typical old English pub with an open fire (the wood smoke permeated the whole place and was so lovely to smell – I miss that atmosphere and that smell) and the food was fantastic. I had roast pork with gravy and asked for a Yorkshire pudding. And, of course, beer. The waiter/manager was Italian! Of course. I would have liked to understand why he was still there but the place was too busy. Just before that we went shopping and I got my last bits and bobs. So a weekend of listening, great food and great beer and meeting some very nice people. So that’s what I got from it but, really, it was for him, so I really hope he got something from it too! And, maybe because I was with him, maybe because of the English pubs and the Indian restaurant – I didn’t hate being back in the UK – apart from the cold and the wet. This entry was posted in Experiences, Friends and Inimies, Outside Italy, People we like and tagged Bloke Things, Culture, Differences, Drink, English, Experiences, Food, Friends and Inimies, Herefordshire, Innermost Feelings, Italians, Outside Italy, People we like, Retrospective, Travel, UK, Weather by Andy. Bookmark the permalink.